The answer is, “Yes!” But, that answer doesn’t always come easily when decades of insecurity preceded finding my strength and confidence. When I was a child, all I wanted was to be like everyone else. I would have given anything just to fit in. I was born with a condition called Oculocutaneous Albinism, which is also the primary cause of my blindness. As a result, my experience with blindness is closely intertwined with my experience of beauty and physical appearance. I believe it is not coincidental that as I accepted my blindness, I also began to find a true appreciation for my own unique beauty. As a person with albinism, my skin, hair, and eyes lack pigment, resulting in a fair porcelain complexion, light blonde-white hair, and light blue/grey eyes. Albinism is typically accompanied by low vision, but there is a wide spectrum for people with albinism in terms of eyesight and photophobia (sensitivity to light). My eyesight has always hovered between a measured acuity of 20/200 and 20/400 with strong photophobia. As I have aged, my photophobia and functional vision have worsened. When I was young, standing out and being seen as someone so visibly different in appearance left me self-conscious. I felt shy and far less confident in myself than I would like to admit. Throughout my childhood, and into adulthood, I didn’t recognize “beauty” in myself. At least not the aesthetic “beauty” typically referred to with that word. My grandmother would say I was beautiful (I mean, she’s a bit biased). I’ve always had a beautiful heart and deep caring for others and could recognize this “inner beauty.” But, if I stood next to any other female my age, I couldn’t see physical beauty in myself. I felt so different from everyone around me. It wasn’t until my late twenties or early thirties that I came to recognize, accept, and truly appreciate, that the features I have because of albinism: my porcelain skin, my white hair, and the unique blue-grey of my eyes, these features are rare, they are beautiful, and they are MINE. This past summer, at the age of 36, my husband and I attended his university alumni reunion, and a friend of ours referred to me as an “Alabaster Princess.” At that moment, he managed to bring together decades of personal struggle with “beauty” in a pivotal, beautiful moment. It was one of those “aha” moments Oprah talked about throughout her career. Aha, my friends, I AM an Alabaster Princess, and I AM BEAUTIFUL! For many years, due to a combination of lack of services offered by my school district, and my self-defeatist avoidance of anything “different”, I refused to travel with a cane. I completed schoolwork and activities with top grades but endured neck, back strain and massive headaches from eye strain. It wasn’t until I was a young adult that I came to understand and accept my blindness as part of me. I believe being blind has been as important in my development as my values, hopes, and talents, but that blindness is still JUST one part of who I am. Around age twenty, I attended adjustment to blindness training, which may seem silly to an observer when you consider I had been blind since birth. This training allowed me to meet others blind people and helped me move toward self-acceptance. It also provided me with the tools I needed to be independent, competent, safe, and confident. I began traveling with a long, white cane, learned the basics of Braille, and learned how to go through life as a bold, blind, beautiful woman with confidence. I became a guide dog handler a decade later and experienced yet another level of confidence, poise, and grace as I traveled with a canine partner. My blindness is one piece of the puzzle that is “me”. (If you ask my husband, that’s probably one massive, complex, 3D puzzle!) I am a daughter, wife, mother, sister, friend, advocate, counselor, speaker, writer, blogger, and crafter. I love life–enjoy this world full of color, reading, movies, travel, organizing, meeting new people, inspiring others to live their best life and lifelong learning. There are many things I’m good at, and there are things I am working to improve–just like anyone else. When I was a child, all I wanted to do was fit in. But as I consider the course of my life, I wanted to fit in when I was born to stand out. I wanted to be invisible in this world where, for some reason, my greater purpose involves being seen. Today, I am a bold, blind, beautiful woman because I utilize the tools of blindness. Today, I am a bold, blind, beautiful woman. I know who I am, what I have to offer the world, and that I may be blind, but blindness will not stop me from living life fully, learning, growing, and giving, one day at a time. Photo credit for all images in this post goes to Colleen McKinzie Photography. 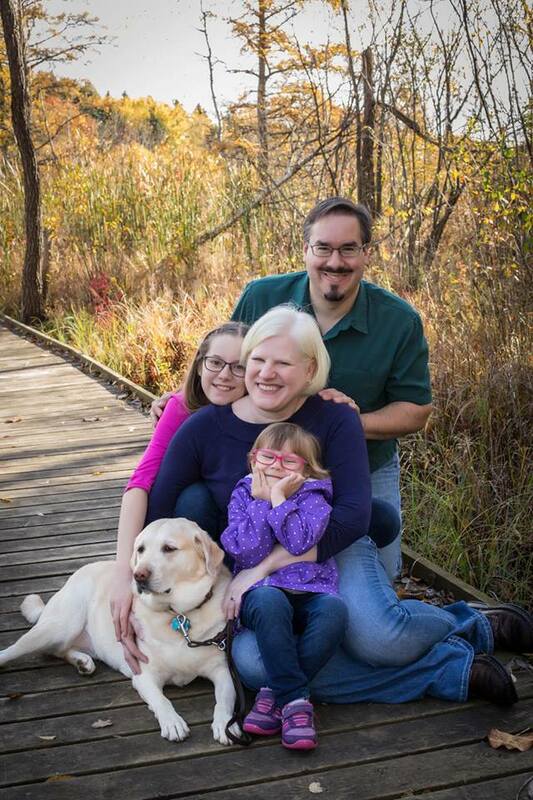 Nicole, her husband, two daughters, and a female yellow lab, Picassa, are posing outdoors on a sunny autumn day. They are sitting on a wooden deck surrounded by autumn colored foliage. Nicole and her two daughters are standing together outside on grass under a golden/orange oak tree. Her right arm is wrapped around her oldest daughter while the youngest is sitting atop her shoulders. In this photo (similar to the featured image) the family standing. Thank you for such a beautiful comment Samia.💖 I will let Nicole know she has more comments. Thank you for reading and for your sweet comment, Samia! I believe that society places most of the constraints and challenges of disability. By that I mean, physical accessibility and access issues aren’t something I can will myself past, they should be planned and designed mindfully for universal accessibility. And when people (employer’s especially) make assumptions or have misconceptions about what a person with a disability is capable of, that assumption impacts employment opportunities for people with disabilities which then impacts self-support and economic structure. It’s a complex and interconnected system, but the truth is, there are simple ways to make our communities universally accessible (and that is so important with our large aging population as well), and with respect to hiring people with disabilities–if the applicant is qualified, the employer would be wise to give them a shot! Most people with disabilities are far more reliable and longstanding employees than people without a disability. Thank you for sharing Stephanie. I began reading while picking my son up from school and had to come back to finish after dinner. Captivating and beautiful! Thank Nicole for sharing her inspiring life story. This is a fantastic story! Thank you for sharing! I really loved reading this – it’s uplifting. I followed you on Instagram! Amazing story! Thanks so much for sharing. Very inspirational. Thank you Carla. One of the things I love about Nicole aside from her kindness and compassion is her upbeat personality. Thank you for reading Katelon. I’ll let Nicole know of your comment.